In the past the most effective way to increase Glutathione levels without spending an arm and a leg on costly IV treatments is to supplement the precursors that allow our bodies to produce Glutathione naturally. One popular supplement can be used to increase endogenous Glutathione production and efficiency, the precursor N-Acetyl Cysteine. N-Acetyl Cysteine or NAC plays an integral role in promoting Glutathione production within the cell, as well as recycling oxidized Glutathione in order to rid the body of toxins and maintain high levels of Glutathione at all times. Unlike a typical immune response that is triggered once the problem has occurred or is beginning, Glutathione is responsible for maintaining health and preventing issues before they occur. It comes as a surprise to most people that our Glutathione levels are actually lowest when we fall ill, they also drop significantly year after year as we age. This makes it very important to supplement Acetyl-Glutathione and NAC daily once you enter adulthood, it may seem early, but Glutathione levels begin to drop after age 20. Years ago it was much harder and much more expensive to supplement Glutathione levels, with the medical breakthrough of Acetyl Glutathione though, it is much easier, cheaper and readily available to everyone to supplement and improve not only longevity, but quality of life most importantly. As mentioned earlier, Glutathione has a very hard time being absorbed by our bodies, breaking down before it has a chance to permeate our stomach wall. Essentially throwing money down the toilet because those Glutathione pills you bought have less than a 5% absorption rate. This has been remedied with the discovery of Acetyl Glutathione benefits, in laymans terms they simply wrapped the Glutathione molecule in a shield. This shield not only protects the Glutathione molecule from harm when inside the digestive tract, it also ushers the master antioxidant directly through the stomach lining and into our bloodstream to be distributed to every cell in our body in a very timely fashion compared to traditional methods. While supplementing precursors such as N-Acetyl Cysteine are an effective way to improve Glutathione levels, it is not nearly as direct or as quick as supplementing Acetyl-Glutathione directly. When supplementing in tandem, NAC and Acetyl Glutathione hold extreme health benefits that outweigh any individual benefits of these super nutrients. Acetyl Glutathione Benefits Your Health Like Nothing Else! A lot of health supplements have a hard time explaining exactly how they help, Acetyl Glutathione is no exception. However, most supplements have this problem because they really don’t help a whole lot, so pinpointing their benefits is a difficult task to say to the least. Acetyl Glutathione has quite the opposite problem; it helps every aspect of your body, health and cellular function. It is present in each and every cell in your body, and every cell in every living organism on the planet. It plays the kingpin role when it comes to detoxifying our cells and maintaining healthy cellular production and function. Some of the more popular Acetyl Glutathione benefits are those to do with liver disease, kidney health and cognitive health and function. Acetyl Glutathione has such a profound effect on these three areas because of its antioxidant role, literally going through each cell, latching onto harmful toxins, free radicals and chemicals, flushing them out of our system before they have a chance to accumulate and manifest into potentially life threatening health conditions. Our liver and kidneys are often overloaded with toxins from our modern environment, lifestyle and dietary choices, bombarding the organs responsible for cleansing our bodies. An overworked liver causes inflammation and eventually cirrhosis and liver failure, all the while it is pouring the excess toxins back into our bloodstream to be distributed across our bodies, accumulating in our brain, tissues, heart and eventually leading to more severe and varied conditions beyond liver disease. When looking for an Acetyl-Glutathione supplement it is important to understand how other nutrients can fit into the equation. First of all, finding Acetyl L-Glutathione is critical. Look for a supplement that also contains precursors that will allow for prolonged production of Glutathione and increase its efficiency. Finding a supplement with Acetyl Glutathione and a precursor such as N-Acetyl Cysteine is a fantastic start, beyond directly fortifying Glutathione levels you should look into supplements such a CoQ10, which benefits cellular energy production. It is particularly useful for individuals with heart issues or those who want to help prevent heart disease. CoQ10 benefits range nearly as wide as the benefits of Acetyl Glutathione, when taken together they can not only dramatically improve your health and wellbeing, but increase stamina, cognitive function and make you feel years younger. The antioxidant and anti-aging effects of Glutathione are unparalleled, now being able to supplement levels through Acetyl Glutathione it allows everyone to benefit from this revolutionary health supplement conveniently. Supplementing Acetyl-Glutathione will do absolute wonders for your health and wellbeing, but to see huge improvements that can be marked and felt beyond a doubt try to incorporate a few other key nutrients such as NAC and CoQ10. These benefits will be felt and recognized, minimizing chronic pain, regulating brain chemicals to improve mood, sleep regularity, all while preventing disease and cognitive decline. It really fires on all cylinders, far surpassing the benefits of more popular antioxidants such as vitamin c (vitamin c cannot function without Glutathione present). Acetyl-Glutathione is too beneficial to ignore its effects and potential to improve your health and lifestyle. 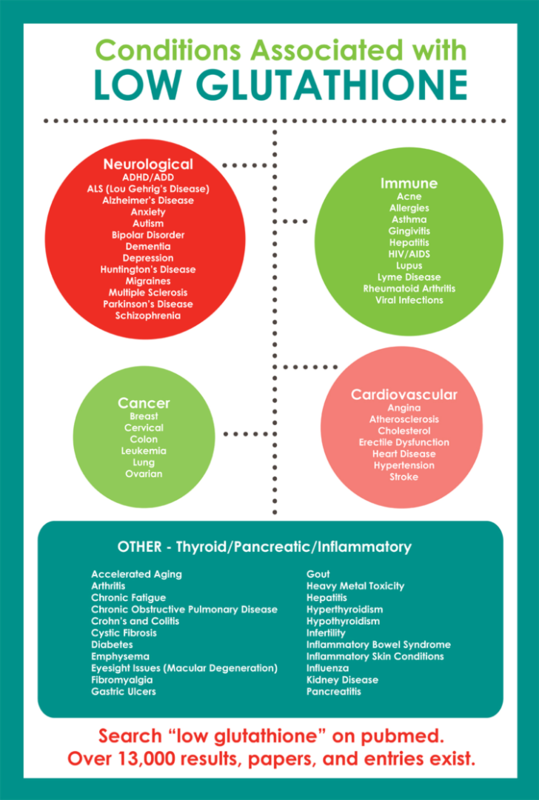 Aging may not be preventable, but the signs and symptoms of aging certainly can be! Murray Avenue Apothecary is the only compounding pharmacy to compound Acetyl-Glutathione the only absorbable form of Glutathione and the Palmitated topical form of Glutathione!